We’re writing you from Haiti, where this morning SOIL’s waste collection teams have been out in our communities since six o’clock, despite protests and strikes disrupting movement throughout cities across the country. SOIL’s sanitation heroes are committed to providing access to life-saving sanitation services – rain or shine. And today, with services around the country on hold, EkoLakay continues to operate so that families have uninterrupted access to their toilets. 1. Toilets are essential to public health and thriving communities. Whether or not we think about it on a regular basis, we all need access to safe sanitation. Exposure to untreated and poorly managed waste has a devastating impact upon public health, and the magnitude of the sanitation crisis is extreme: today, 4.5 billion people lack access to a toilet that safely manages their waste. In Haiti, a country where just 1% of all waste is safely treated, the lack of access to full-cycle sanitation means far too many people die of preventable waterborne illness. 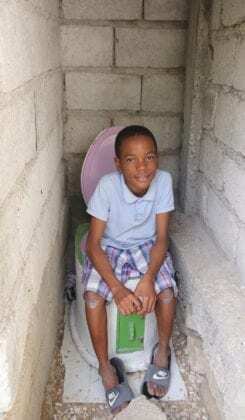 In fact, Haiti has the highest incidence of childhood diarrhea in the world. We love our toilets for removing tons of waste from communities, and thereby protecting families, communities, and local waterways by reducing the burden of untreated waste in densely populated areas. 2. Household toilets help ensure safety for families, especially women and girls. The burden of not having access to a toilet falls most heavily on women, who are often the primary caretakers of family members who fall ill and who are more vulnerable to the risks associated with having to leave the home in search of a safe place to go. Having access to a private, household toilet not only means that women and girls have a safe place to use the bathroom and manage menstruation, it also means they no longer have to rely on a public or shared option outside the home. Did you know that 97% of families with a SOIL toilet in their home report that their family’s personal security has increased since joining the service? 3. Full-cycle sanitation systems dramatically reduce environmental contamination. Around the world, more than 80% of wastewater returns to the environment without being treated. 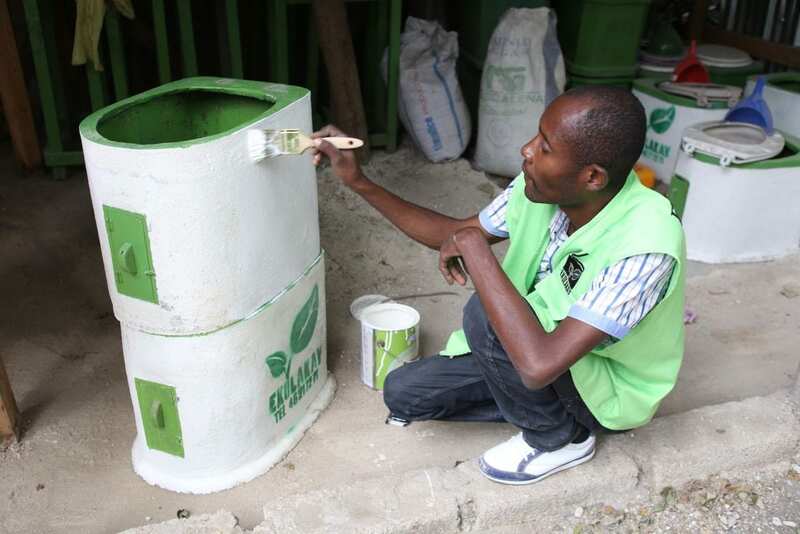 Toilets that ensure 100% waste treatment, like SOIL’s in Haiti, reduce environmental damage by preventing the contamination of aquatic ecosystems and ground water sources. SOIL’s sanitation system was designed to work in harmony with nature, and by removing untreated waste from urban communities and ensuring safe and complete treatment, that’s just what it does. 4. The nutrients in human waste present an enormous opportunity to grow resilience to natural disasters and climate change. It’s clear that having access to improved sanitation is critically important for human and planetary health and well-being, but that’s not the only reason why SOIL loves our toilets. On first glance, a household toilet may seem like an unlikely source for a solution to the climate crisis, but we see the nutrients in human waste as a tremendous opportunity for transformative change. Instead of taking a linear approach and disposing waste once it’s been fully treated, SOIL has built a circular system that captures the nutrients within the waste and returns them to the soil in the form of lush, agricultural-grade compost. The benefits of taking a nature-based approach? Pretty remarkable. What does your toilet mean to you? Help us celebrate World Toilet Day by letting us know in the comments below or join us in conversation online @SOILHaiti. SOIL’s tenacity and rigorous commitment to building and sustaining truly transformative and sustainable sanitation solutions are only possible because of the generous support of our individual donors, which keeps SOIL running through all the ups and downs of working in Haiti. 4 Replies to "Four Reasons to Love your Toilet"
Having traveled widely and experienced conditions from no toilets (on a safari, for example) to composting toilets (in a vacation cottage) to water based solutions that are either self contained or community run, I appreciate my personal access to clean, secure toilets! Keep up the good work! Thank you, Betsy! It doesn’t take much time in places without access to sanitation to learn to really appreciate having easy access to a safe place to go to the bathroom. Happy World Toilet Day! Hi there! SOIL has a wide range of materials and resources on ecological sanitation solutions available online (here!) that would make for a great first step in learning more about potential implementation in your community. Don’t miss SOIL’s Guide to EcoSan!